Why is everything better hot and mushy? This wasn’t your mother’s oatmeal, your grandpa’s oatmeal, your cashier’s or your insurance adjuster’s oatmeal. This was life changing oatmeal. Maybe you’ve grown up with oatmeal–it’s a familiar breakfast food, perhaps a little bit bland. The mushy consistency is unremarkable, and you consider it a symbol of the mundane, of mediocrity, of something that could always be improved upon. I used to think the same way, and then Sunday morning happened. I went to prepare myself a bowl and found a paltry amount of oats left—less than a quarter cup. But despite the feelings of heartbreak and irretrievable loss, I persevered and decided to prepare them the usual way, with white sugar and vanilla and cinnamon and walnuts, cookie-fying it as much as possible. After I poured hot water over the concoction and stirred, I tasted disappointment yet again. I had added too much water and my oats seemed a pathetic, thin gruel. I took it back to my lair in order to eat it unceremoniously in the company of my computer, my preferred breakfast partner. As I sat munching and reading The Rumpus, something miraculous happened: I slowly realized that I was eating the best bowl of oatmeal of my entire life. Each mouthful was bursting with intense, oaty flavor enhanced by the contrasting texture of the walnut’s gentle crunch and the soft oat mush. It was exhilarating. Life doesn’t stay the same after eating the best bowl of oatmeal you’ve ever made. With that shimmering moment of revelation, every bite was a joy because I knew, “This is the best oatmeal I’ve ever tasted. This is the highlight of my life, the crowning of my career. I’m eating my accomplishments. The day is blessed and I can do no wrong.” What could have been nothing more than an oat bummer became the turning point of my entire life. He chuckled, “It sure was. Remember this always. Go and do likewise for others.” And the moment snapped and we faced the earth itself and zoomed downwards, screaming and laughing together. When I woke up, I made myself another bowl of oatmeal. It wasn’t as good as the last one, because the last one was the best bowl of oatmeal in my entire life, but it was still pretty good. Have you thought about oats for breakfast tomorrow? 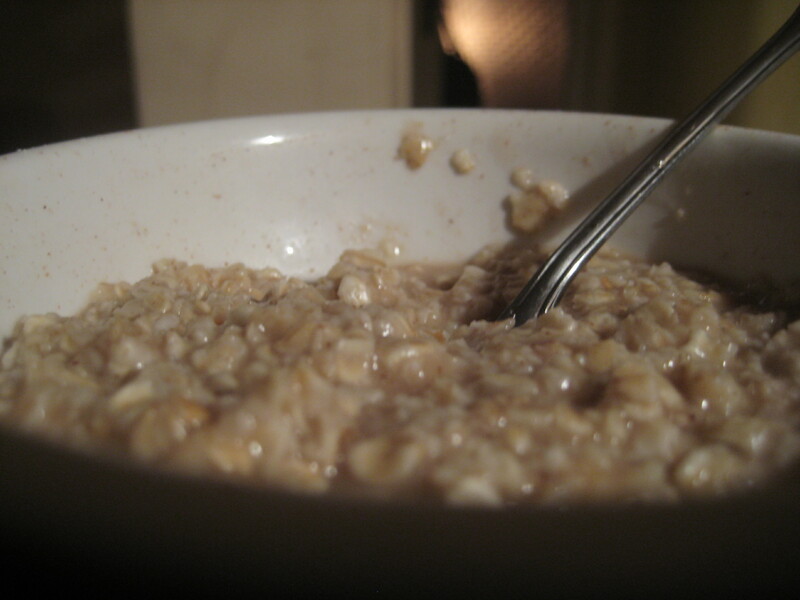 I’m in such a rut – hot cereal every morning – mostly oats. Might I be so bold as to suggest you check out the hot cereal recipe on my blog? It can make every day’s cereal seem like the best. With a variety of ingredients mixed in, every day it’s a little different. I have a tough time with “just” oatmeal now, but I’m glad you liked yours so much. Great way to start the day! It’s never just oatmeal if it’s the best oatmeal of your life—thanks for the hot cereal recipe on the blog. I might just try it! Yeap, oatmeal tomorrow. I add a little extra water and when it’s almost done, I throw in some craisins and hunny. Let that sit (covered) for a bit, then add sliced bananas. The craisins rehydrate, the bananas melt into syrupy goodness and my day is made. Oh my…that does sound delicious. I’ve never thought of putting crasins in Oatmeal before, not to mention bananas. Best days start from the inside out. I would eat breakfast, brunch, and brinner every day if I could without turning into a carb-ball. Believe me when I say it had not been my experience that everything is better hot and mushy. Growing up, I could never achieve a lump-free bown of hot oatmeal and stuck with cold cereal. Roly led me to this blog and I think it’s great. i hope you’ll visit me sometime at Chubby Chatterbox. have a great day. Well thank you for visiting—I will certainly have to stop about the chubby chatterbox sometime. I have an obsession with textures in food—more blog posts about that coming up…eventually. Thanks to Sarchasm for reblogging this. The hot and mushy gives me the warm fuzzies–what can I say. the greatest inventions in life were materialized by chance! Tomorrow morning, I will eat oatmeal in front of my computer and think of you. Och lass, we Scots know oatmeal should be so thick you can hack a slice off and put it in the toaster. And yah’d be havin’ us drink oat soup? Call it an american’s knack for innovation. Gotta second the steel-cut recommendation, if one has the preparation time. “Instant” oatmeal has ruined it for a lot of people. But does anyone know whether there’s any serious nutritional difference between oatmeal with the usual amount of sugar and an oatmeal cookie? I used to put at least 2 tablespoons of brown sugar in my oatmeal as a child, so at that point I’m sure a cookie would have almost been healthier. My modern life has made my oats more mushy, but I would def do steel cut if I had a second. One of three, you are hilarious. Who else could make something as ordinary as oatmeal sound so gratifying? BTW, I think I saw you as you plummeted back to earth, but passed it off as a shooting star. I love organic steel cut oats with quinoa and long grain brown rice cooked in a slow cooker. Use double the water, add a little brown sugar and cinnamon, and whala! That sounds like a fiber lovers dream and I’m a huge fan of the slow cooker. More on my adventures with God in the amusement park today! I’m glad you enjoyed it and I hope you enjoy some oats today. They are, of course, good for any time of the day, and nothing says you can’t even have them twice in one day, if you’re really being crazy. I make the Irish steel-cut oatmeal the night before and let it sit on the stovetop overnight. Otherwise it will take like 30 minutes in the AM and who has time for that? Then I top it with maple syrup and vanilla almond milk and it’s like…well…a hug from the inside. I especially thought of making oatmeal today…since it snowed and it’s the end of friggin’ April. So I said to myself, “Screw it. If I want to be more Irish than I am, I’ll just get drunk.” And that’s what I did. Well done, well done. I wonder if brandy would go well with the oats? I think it would. Irish Coffee would also be an acceptable beverage accompaniment. Try Bailey’s Cream Liquor. Anybody sees it’s milk. Keep posting, sometimes getting those lucky flashes out to the masses brings more. Thanks for the reblog—-now I have a double mitzvah. Crazy day. Now onto finding other mitzvahs. It’s the random stuff that makes life worth living. Can’t hang with the oatmeal but I do seem to be consuming some life altering Cheetos at the moment. I’ll leave orange finger prints on every life I save and baby I deliver. Every time they see the stain, they shall remember and be thankful. You could try the Garden of Eden amusement park instead—they have very reasonably priced season passes. The only shame is for those who can’t embrace the oatmeal. Go forth shameless.